Recently signed to Dream Records, singer/songwriter Joel Vaughn is an artist that you all need to stop and take notice of, if you haven’t already. 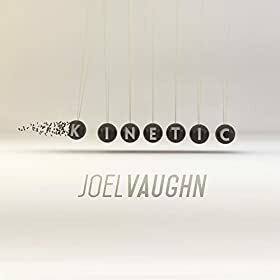 Releasing his brand new album Kinetic on the same day as high profile albums from NF, V. Rose, Jordan Feliz, Phil Wickham and We Are Messengers; this release may slip under the radar initially, but these honest, emotional and heartfelt pop/EDM and reflective ballad melodies are indeed a few of my favourites of this year thus far, with Joel blending CCM and worship styles, creating an honest, raw and emotional moment of praise and adoration to our God and King. Essentially another EP (with 5 new songs we well as a 1-minute intro and 2 remixes! ), let’s dive in and see how these 5 songs have spoken to and ministered to me. The 1-minute epic orchestral instrumental piece “Synesthesia” serves as the perfect opening and segue into the first full song “Wide Awake”, as Joel deftly and creatively utilises instruments to create a crescendo that has us fully invested and immersed into his unique and captivating music genre. In essence this intro could have been included as part of the “Wide Awake” track, but anyway…the presence of the synth and the pulsating drums makes for an interesting album opener. Minor nit-pickings aside, “Wide Awake”, this first single from Joel, dives straight in thematically as Joel delves into the concept of waking up fully and living life to the fullest, and not going through the motions. Brimming with electronics and a catchy chorus and beat, this pop melody is something that you would probably hear at a club, as Joel challenges us to live a life full of meaning and substance, and passionately reiterates that with God ‘…I can see I’m wide awake, there’s a fire in my heart I can’t put out, now it’s breaking through the day, Your love, it makes it inside out, nothing else could separate, I don’t have to feel my world is crashing down, I know Your love will stay the same, no height or depth could bring me down…’. The electronic mid-tempo ballad “Hysteria” is next, and while it took a few listens for me to somewhat understand the message, on a deeper look we are presented with a lyrically clever and layered track. As Joel likens our relationship with God to allowing hysteria to enter our lives, we are reminded that living with God may be a bumpy and interesting ride, however the song also highlights that our lives will be all the more enjoyable and satisfying. Both the aforementioned tracks- “Wide Awake” and “Hysteria”- also receive the remix treatment (by Chris Howland and David Thulin respectively), with the former staying pretty close to the already remix like and electronic original, while the latter being almost unrecognisable and re-done. Yet while on the surface these renditions may be unnecessary on the surface, a deeper listen reveals to me that both remixes work add extra depth to these melodies. “March On”, “Truth About Me” and “Far Away” are the final three melodies, and each reiterate to us powerful eternal truths to us that are relevant and important to today’s society. “March On” is a slow build guitar led inspiring melody where Joel ardently points out that all we need to do as Christians is march on living life the way Jesus wants us to, instead of living life the way the world wants us to; of which the execution of the thought provoking melody reminds me of label-mate Jonathan Thulin. The penultimate melody “Truth About Me”, driven by stirring keys, brings the melody back to the 90’s as I am reminded of vocal groups like Avalon and Plus One, and paints a hopeful picture and tells a story of believing the promises of God, as Joel imparts to us that ‘…maybe it’s time that I believe that the truth about me is what You say, that I am loved and I am free and I am covered by Your grace, that I am strong but when I’m stumbling, nothing’s gonna change what You see, that I am Yours…’; while the album ends with the piano led encouraging potential single “Far Away”, which imparts to us that though many people may believe the misconception that God is indeed far away, the fact still remains that He loves us and longs to be a part of each of our lives, and should give us hope and reason to be positive in every aspect of our lives. Well done Joel for showing to us 5 original songs as well as remixes, giving us comfort and solace during the times we need encouragement. With Joel’s independent EP last year, I was surprised in a good way, with every song a highlight personally, and Joel’s heart for worship quite admirable. In Kinetic, now that Joel Vaughn is signed, the production is cranked up a notch, with Joel’s passion for Jesus greater than ever. With songs for personal and corporate worship infused together, as well as inspiring pop melodies as well in this short but sweet playlist; what more do I have to say to convince you that this EP is something you all need to listen to? Well done Joel, I can’t wait for your next release, as you inspire people to live for Jesus!